Primorsky Territory hunter supervision experts specify that tigers rarely attack humans first – in 90 percent of cases humans are responsible for provoking the attack. Sergei Aramelov, the director of the Primorsky branch of the Amur Tiger Center warns that generally there are four instances where a tiger might attack a human: when someone tries to take away its food; when a mother is protecting its tiger cubs and someone interferes; when a person is accompanied by a dog that a tiger perceives as a wolf (a competitor in the food chain) and the dog hides behind its master; and when a person shoots at a tiger. When a tiger wants to attack, it silently stalks its prey and then springs at it, moving at a speed comparable to a car (up to 80 kilometers per hour). Let’s face it: a Siberian tiger is an animal that is best seen at the zoo. However, if in spite of everything you have made up your mind to see one in its natural habitat, you need a good plan. 1. Gather information. Before going off in search of a tiger, try to find out as much as you can about these animals. To start you can acquaint yourself with the bronze tiger statues in Sports Harbor in Vladivostok – they are believed to bring good luck. Walk the “tiger trail” and count the granite slabs – they stand in for countries where tigers can be found in the wild. A total of 12 monuments to the Siberian Tiger are scattered throughout Vladivostok. 2. Get a good look at tigers from afar. There are three fully-grown Siberian tigers living approximately 70 kilometers from Vladivostok in the Primorsky Safari Park. Evaluate their size, sharp claws and speed. Perhaps such a visit will make you realize that meeting these tigers without a double layer of protective netting is not a very good idea. If you have not changed your mind, read the next point. 3. Talk to the Udege people. In the village of Krasny Yar (120 kilometers from Vladivostok) live the Udege people, indigenous inhabitants of the taiga, who know more than anyone else about the Siberian tiger. They literally live side by side with tigers and they can tell you a lot about their character and habits. In Udege culture the tiger is a sacred animal, “a master of the taiga,” which you can turn to for help and protection. There are many beliefs and folk sayings associated with them. It is thought that if a hunter shoots a tiger, ill luck will pursue them for the rest of their life. But if a hunter shares their gains with a tiger, taking half for themselves and leaving half in the forest, good luck will instead follow them. But even among the Udege not many have seen tigers as these animals are wary of people and try to stay out of their way. However, if a tiger is aggressive and wants to attack, it will stalk and the prey will not even notice it. So, if you are walking in the forest and suddenly meet a tiger it is more likely than not that it will not attack you, but is simply satisfying its curiosity. Nevertheless, it is best if you do not encounter a tiger alone, but instead in the company of experienced guides. 4. Find experienced guides. The best ones are from the Amur Tiger Center. This is a non-profit organization that is engaged in the study and preservation of the Siberian tiger population. They can help organize your journey. 5. Walk the Severny (North) Cape nature trail. This five-kilometer tourist route that leads to the sea’s coast is located on the territory of the Sikhote-Alin Nature Reserve. The 20 Siberian tigers that live there walk around the reserve and are relatively easy to spot (meaning not that easy). The population includes the tiger Murzik and the tigress Varvara whose traces you can see on the shore. Perhaps, they will be watching you from behind the trees while you (accompanied by an officer of the reserve) are walking towards Severny Cape. When you reach the sea, check out the seals basking on the rocks – they are easy to watch from a viewing point. 6. Go deep into the taiga. After enjoying a few minutes with the seals, turn away from the tourist route into the depths of the forest. An ax and rubber boots will come in handy here to make your way through mud and swamps. Be careful: you have left the domain of people and have entered the territory of wild animals. They say that a tiger attacks the last person in the group, while a bear attacks the first one. So, when you are going through the forest, always remain between your guides. This way they can keep everything under control and warn you of any danger. Pay attention so as not to miss animal traces. Pay attention to birds. If you see their craws, then your goal is within reach – the predator is nearby. 7. Appease a tiger with food. 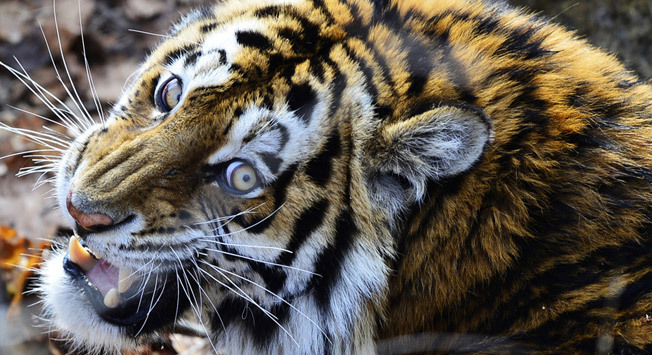 Boars, deer, roe deer and Manchurian wapiti are all favorites on a Siberian tiger’s dinner menu. The dish it consumes the most is the marcassin, because it is an easy prey. Install tray feeders made of older materials, because the smell of fresh planks can scare animals away; they tend to avoid tray feeders like this. 8. Check trail cameras. They are used to keep track of tigers. Trail cameras are fixed on tree trunks, work for a long time without recharging and shoot in all kinds of weather at any time. Monitor trail cameras on your laptop and you will see recordings and photos of tigers, which can be close, perhaps even closer than you had imagined. 9. Try to stay calm. Perhaps you have finally met a tiger and suddenly realize that this is not what you were hoping this moment would be. Perhaps you want to run away or sink into the earth because there is a 300-kilogram predator a few meters away and you know nothing of its intentions. Firstly, remember the things you must not do: look a tiger directly in the eye, turn your back on it or try to run away. Secondly, try to drive it away with noise: a tinkling sound, the cracking of wood or starting a signal flare are all good options. You can scream at the top of your lungs, but your voice should sound calm and confident as a trembling, broken voice will not scare off a tiger, but will remind them of a victim’s dying cry. If a tiger does not leave, start backing out slowly. To distract the animal, leave your things along the way as you exit: a coat, a backpack or any other equipment. Walk backwards until the tiger is out of sight. Run away as soon as it is.